All external students who bring a vehicle onto campus are required to pay for parking. Purchase a Parking Ticket form any of the seven parking machines on campus. How much does it cost to park on campus ? Where does a Blue Permit or a Parking Ticket allow me to park? 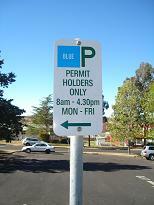 Blue permits, both Trimester & Annual, only allow parking in Blue Permit Bays. Parking Tickets allow you to park in any Purple (Visitor) or Blue Permit bays. Normal parking rules apply to Timed Bays, Loading Bays, Motor Cycle and Disabled Bays. Vehicles identified as being in breach of the UNE Parking Policy & UNE Parking Procedures are subject to a Penalty Notice being issued.